For some reason at the beginning of every year, I feel like getting back to the basics. 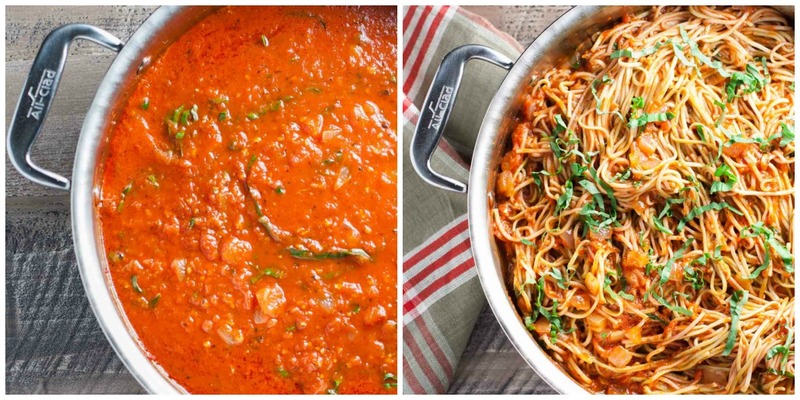 Do you have a Classic Marinara Sauce that is your go-to? 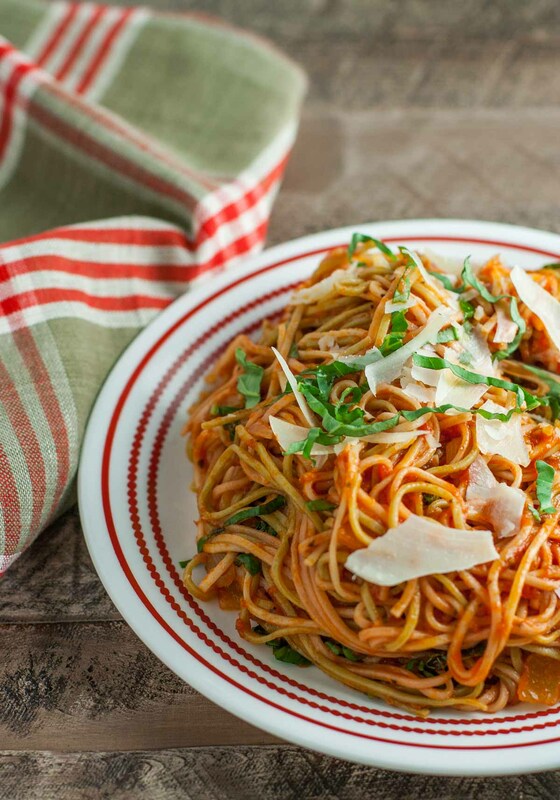 That fresh, bright red, garlicky, basil yumminess of a sauce? 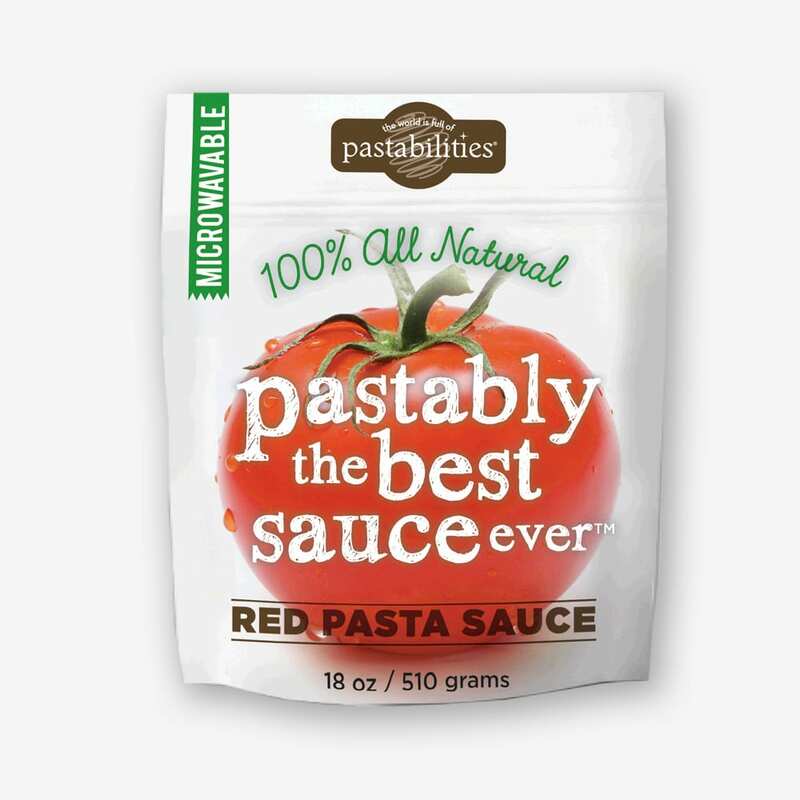 Something you can always have on hand for a quick dinner, or a great base for a meat or seafood sauce, or even enjoyed as a fresh pizza sauce? Well, you need one! So I thought we’d start off the year together with this simple and fabulous recipe, and see where that takes us – are you in?! Prego! When you see “Marinara” in a recipe description, the name leaves a lot open to interpretation. The common ingredients are usually tomatoes, olive oil, garlic, and herbs. Some recipes call for onion (which I prefer), and some even add other vegetables such as carrots and celery. But when I think of a classic – the simpler, the better. Legend has it that Marinara sauce, also referred to as “Sailor’s” sauce, originated when sailors’ wives saw their husbands’ boats off on the horizon coming home after months of being away. The ladies rushed home quickly to put together a homemade meal…the first one many sailors would have had in months! I love that story because it evokes happy thoughts of cooking for our loved ones, although it’s likely a myth. We all usually have these simple ingredients in our pantry and that is why it should become your new go-to…. Now, I believe strongly in starting with the best quality tomatoes possible. This means San Marzano whole peeled tomatoes, imported from Italy. They are the least processed of all the canned tomato varieties, and have the depth of flavor and bright color that will make your Classic Marinara Sauce pop. You’ll notice in the “collage” below where I picture my hand blender next to the can of tomatoes. I literally open the can and pulse blend the tomatoes right there (in the kitchen sink of course)! Do not puree the tomatoes until they are smooth, but leave a little texture. Note: I buy my tomatoes at Costco, but you can find Italian whole peeled tomatoes in most grocery stores. They cost a bit more but are worth it! Also, be careful to saute your onions over a low, or med-low heat, until they are translucent and soft. This takes about 12-15 minutes. You do not want them to brown all at…just soften them so they add their sweet flavor to the sauce, but no crunch. I add the minced garlic and dried herbs in the last 2 minutes of sauteing the onions. This gives the herbs a change to “come to” and maximize their flavor impact. 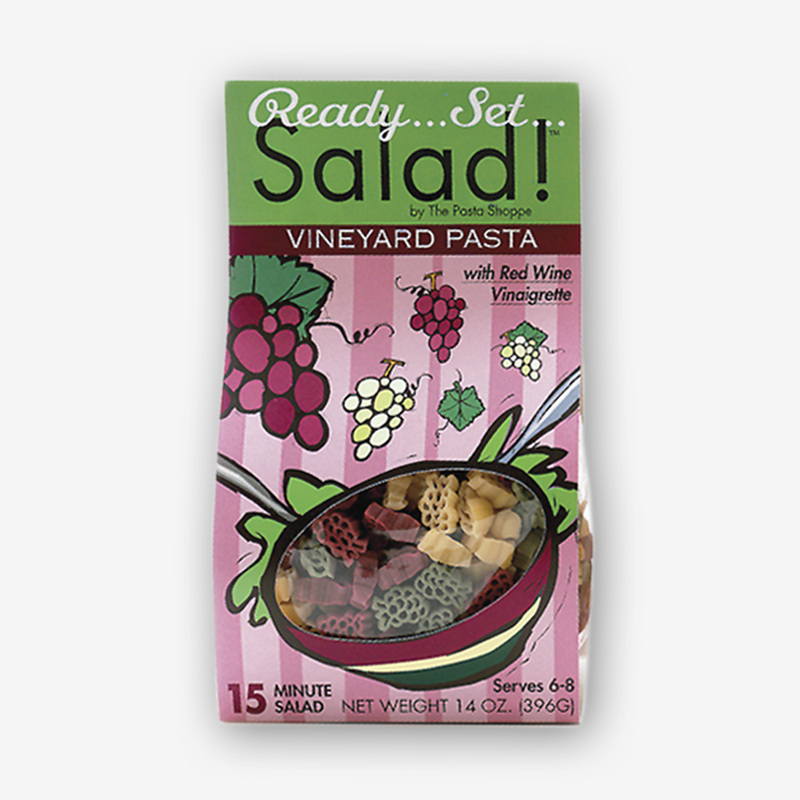 You’ll notice too that I use dried basil and also fresh basil…you can never have too much basil! The rest of the recipe is really straightforward. 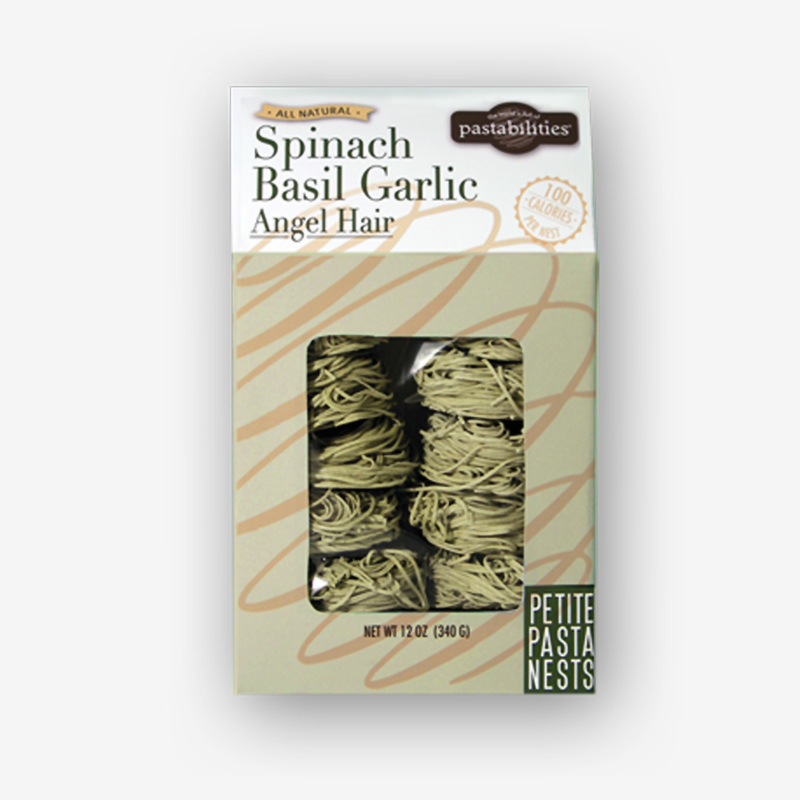 I LOVE this sauce and here served it with our Tri-Color Angel Hair Pasta Nests. Of course, any pasta shape can be used. 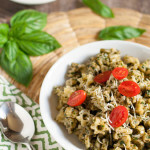 Other classics worth noting are our Everyday Basil Parsley Pesto and Classic Tomato Basil Pasta. The key to beautiful squash strands is to use a fork to scrape out the squash halves. Roasting only takes about 30 minutes and you can certainly do this ahead and serve later! The colors look bright here – but they actually are that bright! Very colorful and healthy…I’m feeling so good right now! Classic Marinara Sauce can be made and frozen so you always have it on hand. Think about freezing it in 1-2 cup portions. There are many uses for this classic red sauce and I look forward to adding some meat, sausage, etc. and sharing my results! A good classic never goes out of style. 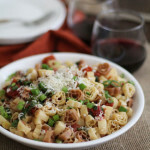 So I hope you enjoy this recipe over and over again. 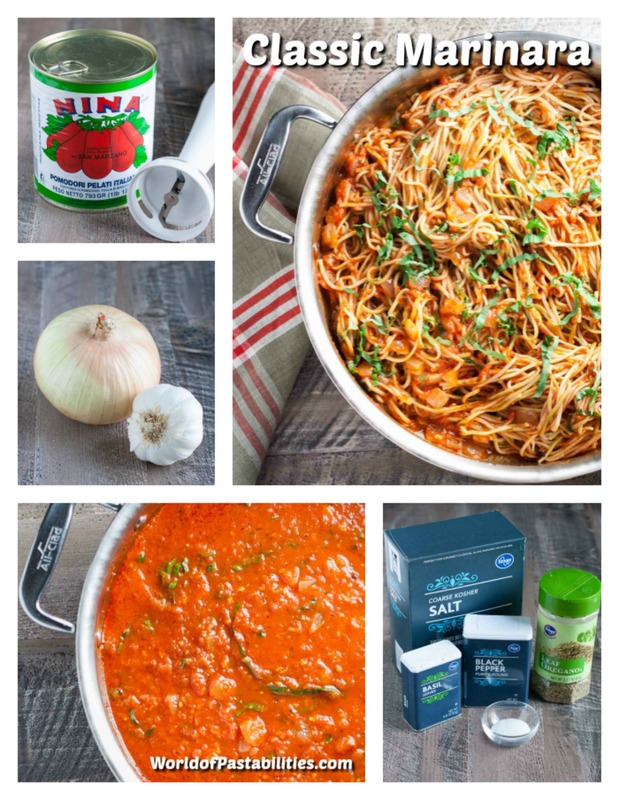 I’d love to hear how you incorporate Classic Marinara Sauce into your dinner lineup…so please share and let me know! 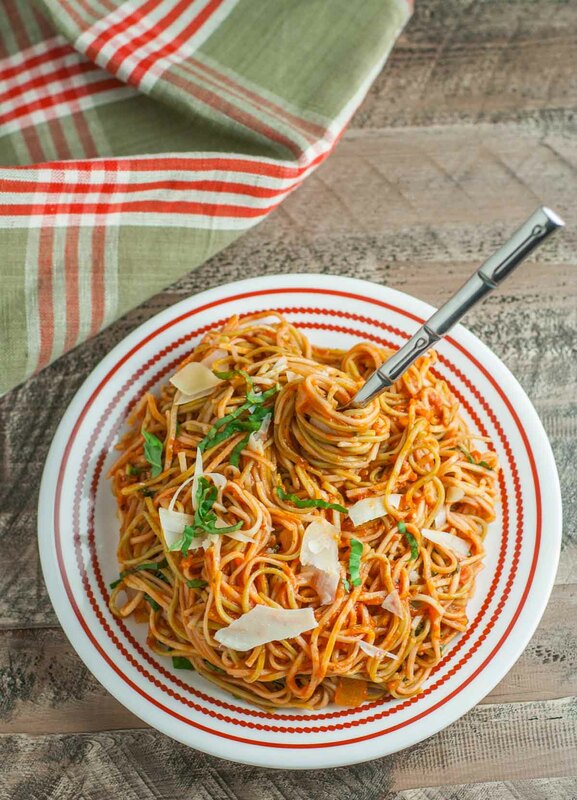 Fabulous classic red sauce - bright in flavor and versatile in use! Add meat, sausage, seafood, or use a pizza sauce! 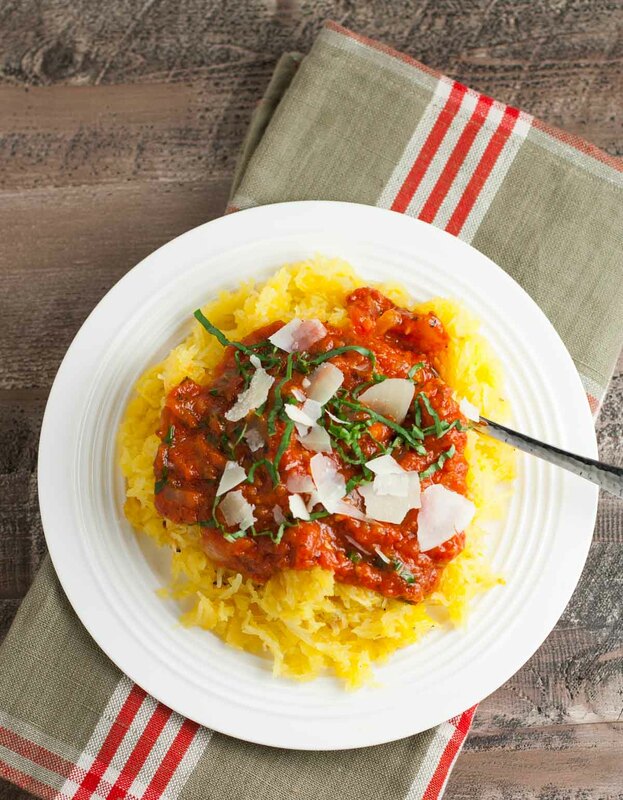 Try it also with roasted spaghetti squash for another healthy option! 14-16 oz. Tri-Color Angel Hair Pasta Nests (or any other pasta!) 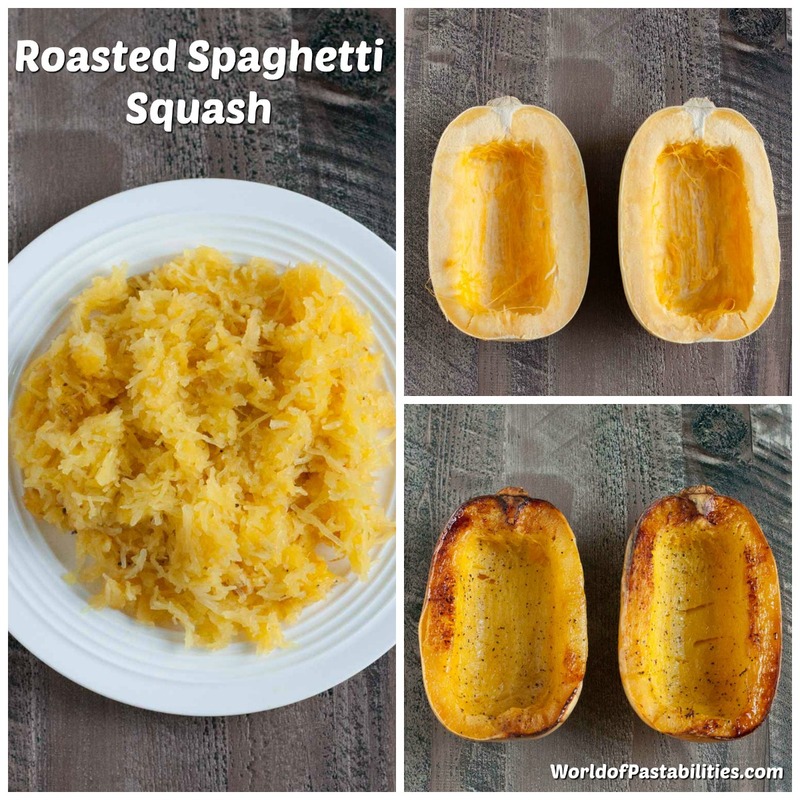 Or 2 Spaghetti Squash, halved, roasted, and shredded with a fork. Cook pasta according to package directions, drain and rinse briefly, and toss with 1 T. olive oil. Set aside. 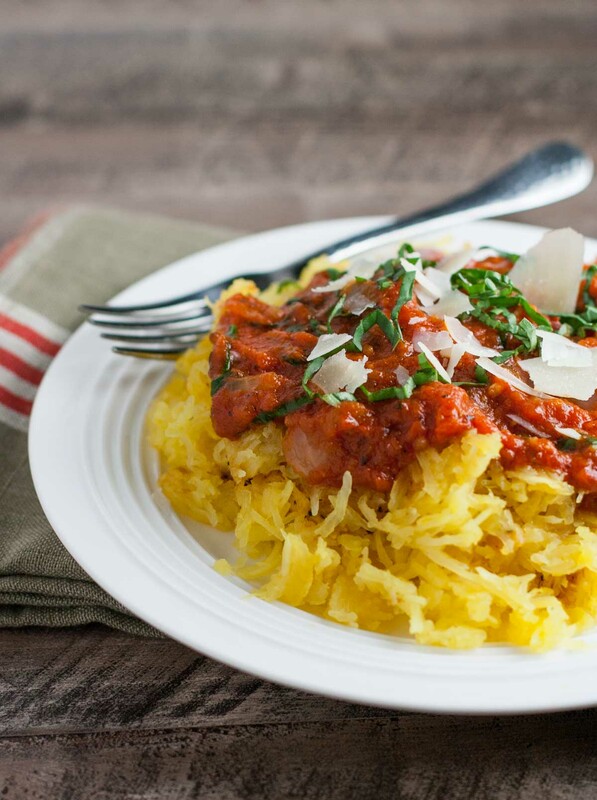 For spaghetti squash, cut each squash lengthwise. For ease, have produce dept. cut them for you as they are very tough. If not available, I microwave my squash whole for 1-2 minutes until they are slightly soft. Makes cutting them somewhat easier. Either way, be careful...and cut on a surface that is stable. I always put a towel under my cutting board for safety. Scrape out the seeds. Brush squash with olive oil and season with salt and pepper. Roast cut side down at 450 degrees for 30 minutes. Cool slightly. Use fork to scrape out squash noodles! Set aside. Pulse tomatoes in can with a hand blender (less messy in kitchen sink!). Make sure not to puree to a smooth consistency but leave some texture! In a medium saute pan, bring olive oil to medium low heat. Add chopped onion and saute on medium low for 12-15 minutes. Do not let onions brown but only turn translucent and soft! With 2 minutes to go on onions, add minced garlic and dried basil and oregano. Add tomatoes, salt, pepper, sugar and bring to a boil. Reduce heat to simmer and cook partially covered for about 20 minutes. Add fresh basil and stir. 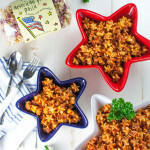 Add cooked pasta to pan and toss with sauce. If serving squash, plate squash and add marinara sauce on top. 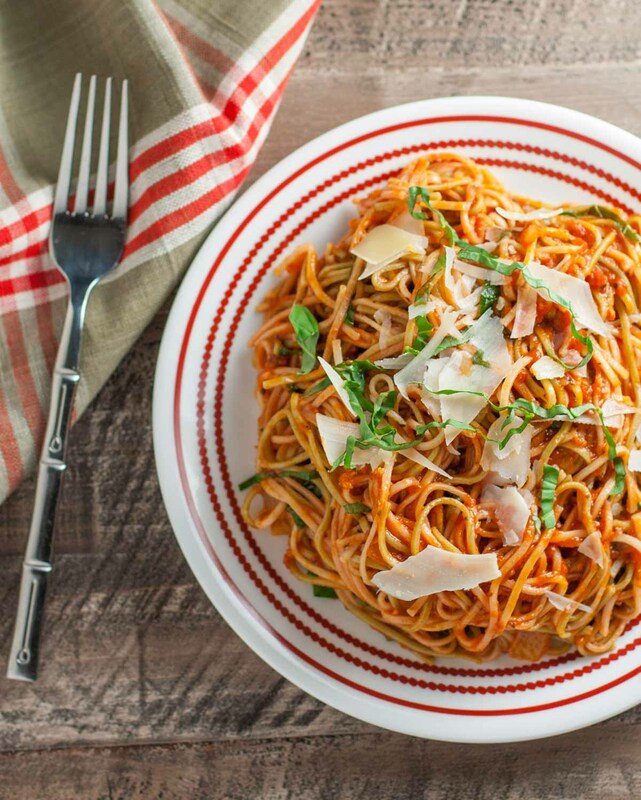 Plate the pasta and top with additional fresh basil and Parmesan. Top squash the same! I can’t wait to try your Classic Marinara! I’m going to use it the next time I make Chicken Parmesan. Great idea with the Chicken Parmesan! Let me know hoe you like it!! I’m a red sauce gal, love it! Do you think it would be okay to remove the onions from the recipe? My husband can’t eat them. Maybe there is something I could add to make up for the onion flavor? Never had roasted squash before..and this looks awesome! Please try it – you’ll really like it even if it sounds scary!! this looks so simple and yummy! i can’t wait to cook it for dinner tonight! Love this and want to try it. Sounds delicious! I just made the spaghetti squash last night with a marinara, chicken and mozzarella. It was relicious, but I looking forward to trying your marinara recipe. It sounds delicious! I love marinaras!!! That is such a coincidence! This sauce is so flexible so I hope you find lots of ways to enjoy it!! Yumm! This Classic Marinara Sauce looks Delicious! This recipe sounds delicious. My grandkids love posta, will make it next week when they come. I think they’ll like it! Make sure there is lots of cheese on hand…all the kids love the Parmesan! Sounds good. I just use canned or bottled sauce and boxed pasta. This looks delicious. I enjoy making my own sauces from scratch. Never have made my own sauce, will have to try this recipe! It’s really easy and I recommend giving it a try! This is really a good “first” to experiment with! Very similar to a sauce I make which is great straight from the stove, and even better refrigerated overnight! This is perfect for when I want to go meatless! I like to use mine for spaghetti and lasagna. I am going to try your tip about adding dried herbs to the onions in the last couple of minutes of cooking. Could you 1/2 or a little less of the onion? Many recipes for marinara leave out onion all together, so you could try that too…if you make this, please return and let me know! 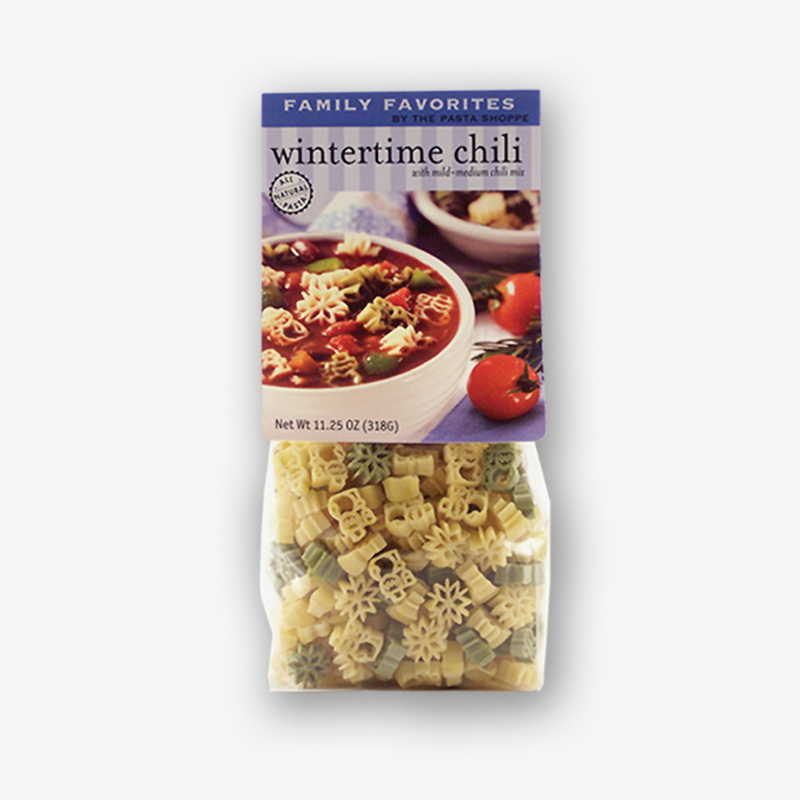 Has anyone tried this with fresh – instead of canned – tomatoes!? Hey Paula! Good question…if you use fresh tomatoes, you’ll need to use a lot of them. Canned tomatoes have some tomato paste or juice that helps make the sauces consistency. Fresh tomatoes may make the sauce chunkier too. Also, fresh tomatoes can be tricky depending on the time of year! So you’ll have to watch the intensity of flavor too. Let me know how it turns out if you make it – I’d love to know! I made two batches, both were winners. Good body, texture and taste, I used sugar in the raw and added one red pepper – outstanding. Thank you! So happy you liked it! Love your substitutions!